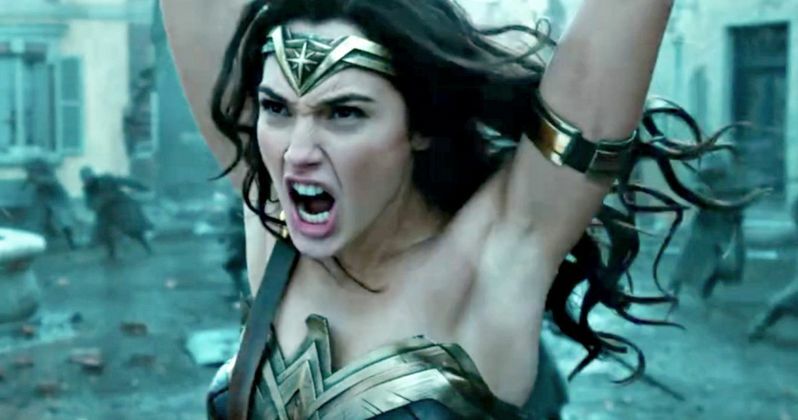 Warner Bros. bows to pressure and attempts to fix Wonder Woman's armpits. The internet is truly a strange place where just about any subject can be magnified, argued, and overanalyzed to the point of absurdity. Last month, some eagle-eyed interweb sleuths noticed that the Wonder Woman Origin trailer revealed something unnatural and unbelievable about Gal Gadot's portrayal of Wonder Woman. Was it that she was deflecting bullets with her cuffs or was it that she was able to lift and throw an automobile? Wrong on both counts. At exactly the 1:47 mark in the Wonder Woman Origin trailer, which comes courtesy of YouTube, Wonder Woman lifts a tank over her head and heaves it towards some unsuspecting enemies. The interweb detectives noticed that if you freeze-frame at the right moment, one can see the unnatural look of Gadot's armpits. Yes, her armpits. Gadot's armpits appeared to have been paler than the rest of her skin and extra smooth and the internet voiced negative feelings. Some wanted to know why they would obviously digitally alter Wonder Woman's armpits and some wanted to know why her armpits weren't shown in a more natural way. Soon everybody wanted to know all about the grooming habits of a fictional female superhero. But wait! There's more! Warner Bros. clearly caught wind of armpit gate and have gone back to digitally alter Gadot's armpits yet again. This time the armpits are still silky and smooth, but the skin tone is matched to the rest of Wonder Woman's body, leading one's imagination to wonder if Wonder Woman takes time out of her day to tan her armpits. So hopefully now the world can go back to worrying about something other than a superhero's grooming habits. One can only hope. Maybe there's a bigger issue here. Patty Jenkins, who directed Wonder Woman, appears to not be as well promoted as directors of past and future DCEU films. The film is set to debut next month and it has received a noticeably smaller chunk of the marketing of say Suicide Squad or Batman Vs. Superman. A standalone Wonder Woman movie, the first standalone female lead comic book film for DC or Marvel, should be a bigger deal. The answer could be in the projected box office numbers. Rumors suggest that the "low" projection of an opening of $83 million isn't good enough for Warner and their DCEU. Regardless of the reason, this is an important moment for Hollywood and hopefully Wonder Woman can prove the rumors to be untrue. Wonder Woman is set to open on June 2nd, 2017 and is sure to be a hit, no matter what Gadot's armpits look like. The movie will be followed by the Justice League movie opening in November 2017 where Gadot will reprise her role as Wonder Woman. Only time will tell what her armpits will look like in Justice League, maybe Warner and DCEU will go with a new look for the armpits or possibly Wonder Woman will gain a special sweater that covers said armpits and has other super powers. We have an image a fan made to show the difference between the two armpits in what has fittingly become known as armpit gate.